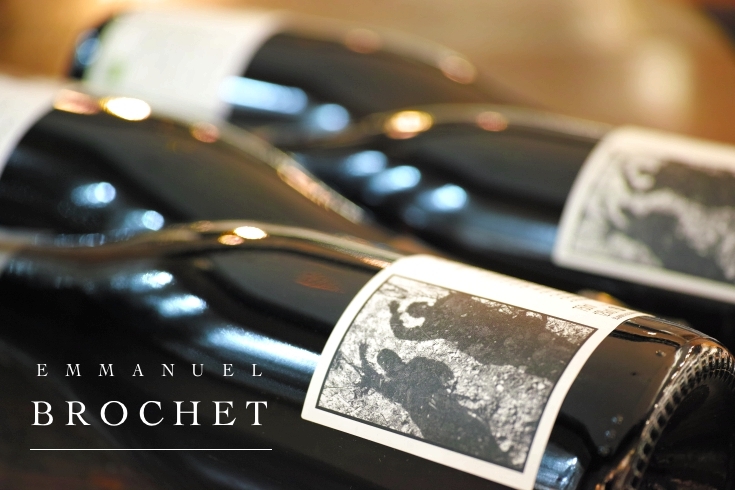 Emmanuel Brochet manages 2.5ha parcel of Le Mont Benoit which was inherited from the family, and had begun to produce the wine in 2002. The domaine is located in the village of Villers-Aux-Noeux in the Montagne de Reims and major three grape varietals(Pinot-Noir, Pinot-Meunier and Chardonnay) are planted. Old vines(planted in 1962) are arranged on the upper part of the hill and younger vines(planted in 80's) are on lower part. This silt, clay and chalk vineyards are cultivated organically and were certified in 2011. He does not use any chemical in the vineyards and in the cellar as well. Fermentation is carried by wild yeasts and minimum SO2 is added. This all hand-made extra-brut champagne is being produced around 8,000-10,000 bottles/year. The main cuvee is Le Mont Benoit, and it is usually composed by major three grape varietals from two different vintages. This lot "L14/13" is made from 2014 vintage and 2013, Pinot-Noir 33% / Pinot-Meunier 37% / Chardonnay 30%. Aged in barrel for 11months + 30 months in bottle. Dense, complex, and pure fruits. It's a great white wine rather than Champagne. The bubbles are finer and softer than L13/12. We suggest using wine glass(Gravner glass is the best! And never use thin flute type champagne glass) to stabilise bubbles and let wine focus.